Great Landscaping Makes a Great Home! The secret to great landscaping is to combine good planning and design before you begin. 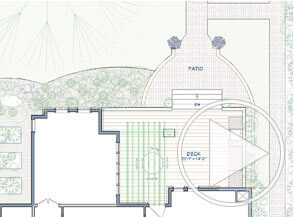 Whether you have a new home or an existing landscape, you'll find valuable resources to create a well-planned outdoor living space with our deck and landscaping software tools. 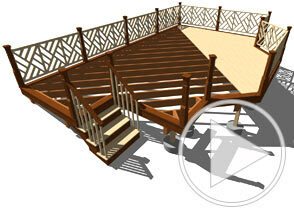 Design your new deck or patio with the deck designer tools. Automatically generate a materials list or create cut and buy lists. Choose options for deck roofs, foundations, framing, deck planking and railing styles. Create flat, sloped or irregularly shaped lots. Define the lot shape, elevation and contours with powerful terrain modeling tools. Show your lot setback requirements, roads and sidewalks for neighbors or building professionals. Outdoor kitchens are one of the most popular trends today and creating yours can be easy. Choose from name-brand appliances and furnishings from the architectural 3D Library to create realistic outdoor living areas. Create the landscape you have been dreaming of. 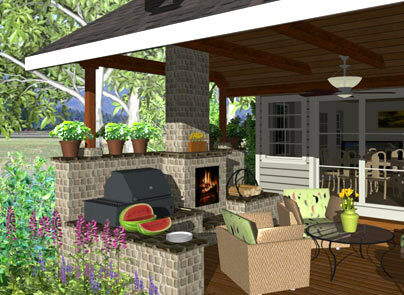 Plan and design your outdoor living space with terrain features, gardens, and plants that allow quick and easy customization so you can visualize your finished yard in 3D. Choose from over 3,600 botanically accurate flowers, trees and shrubs - from tropical to desert. Use the Plant Chooser for detailed plant information including hardiness and growth. 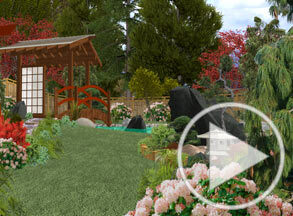 Use Pre-Arranged landscaping beds from the 3D Library to quickly add visual appeal to your designs. 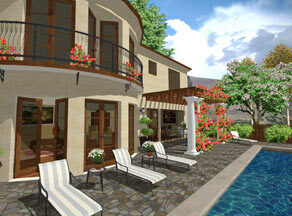 Create gardens, pathways, hills, valleys and ponds for the perfect landscape. Driveways and sidewalks will automatically follow your terrain contours. Insert water features with Stream and Pond tools. With landscaping, use the Grow Plants slider feature to see future plant growth. 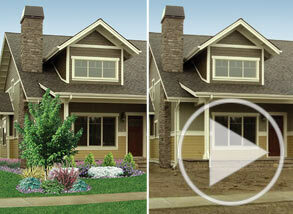 Import a photo into the program and use it as a backdrop for your landscape or deck project. Remodeling your home and want to see your new view out your window? Take a picture and visualize your changes before you remodel.